The sick building syndrome (SBS) consists of a group of mucosal, skin, and general symptoms that are temporally related to working in particular buildings. It is the workers who are symptomatic, but the building or its services which are the cause. The common symptoms and a method of assessment are shown in box 2. The average number of work related symptoms per occupant is known as the building symptom index. It can be measured reproducibly by simple questionnaire surveys. The building symptom index shows a wide variation between different buildings (fig 1); “sicker” buildings often have conditions of air temperature, humidity, and lighting levels that fully comply with current standards. Some of the reproducible “facts” shown in studies in different countries are shown in box 1, and factors related to higher (sicker) building symptom indices shown in box 3. Box 4 shows the WHO standards for the management of building ventilation systems. Money spent on the building services is likely to be cost effective in terms of the lost productivity in symptomatic workers. Range of building symptom indices in a group of buildings studied with the same questionnaire with a maximum of 10 symptoms (the actual BSI is dependent on the number of possible positive answers and differs between questionnaires). There is a wide range of symptom prevalences between the occupants of different buildings, not explained by personal factors. Air conditioned buildings generally have a higher prevalence of symptomatic workers than naturally ventilated buildings. The sick building syndrome occurs in buildings that fully comply with current design standards in terms of temperature, ventilation, and lighting. Although various chemicals (particularly volatile organic compounds) have been related to symptoms in individual buildings, none have been shown to be a cause of SBS in a wide range of buildings, including those with natural ventilation. Naturally ventilated buildings often have conditions of temperature and ventilation outside recommended standards, and yet often have fewer workers with SBS symptoms. “If ‘yes’, was it better on days away from the office?”. The building and its heating, ventilation, and air conditioning systems should not produce biological contaminants which are introduced into the ventilation air. If biocides are unavoidable, they should be prevented from entering space which can be occupied. Standards and building codes should ensure effective maintenance of ventilation systems by specifying adequate access paths, regular inspection, and maintenance schedules. In a building, in which occupants cannot effectively control the quality of ventilation air, an individual who is responsible for this task should be identified to the occupants. The maintenance personnel of public and office buildings should be given adequate training for routine inspection and maintenance for the building systems. There are many sceptics as to the validity of the sick building syndrome diagnosis. The name is confusing, as it is the workers rather than the building who suffer from the symptoms, but the cause is with the building and its services. There are few objective tests to validate the symptoms, the exception being those with dry eyes where objective validation is possible but difficult.2–4 Some regard the symptoms as psychological (implying that they don’t really exist). Lethargy is a psychological symptom, but yet can have organic (within the building) causes. The psychological versus organic debate does not produce much enlightenment or resolution of the problem. Problems can easily get out of hand due to the organisation within a working group. To whom should an individual who perceives health related symptoms due to work in an office type environment turn? There is an association between the perception of poor indoor air quality and symptoms.10 For instance it is likely that the perception of dryness in the air relates more to increased temperature and particulates in the air than to water content; one study showed a fourfold reduction in perceived air dryness following air filtration, without changing the water content of the air.11 Indoor air is often perceived as dry and stuffy, which can easily lead to the ventilation engineer being asked to solve the workers’ symptoms. Unfortunately there is no association between the sensation of air dryness and the water content of the air.10 The measurement of normal humidity if often used to show that the air is not dry, and that by implication the workers’ symptoms are not due to the building environment. Assessment of workers’ symptoms is the role of occupational health professionals, who should be involved at an early stage. The first step is to visit the workplace and carry out a “walk through survey”. Obvious factors of gross overcrowding, poor cleaning, space management, water damage, and the occupancy of areas of a building not designed as workplaces can be identified without technology. A workforce questionnaire is the next step if there is doubt as to the “realness” and degree of the problem. The questionnaire aims to estimate the building symptom index, the average number of work related symptoms per worker. There are different questionnaires available; many are sufficiently robust for use.12–14 Box 2 shows a suitable one. If the building symptom index is outside the norms, further work is needed. Responding to complaints by measuring individual pollutants is rarely helpful. There is an association between the amount of paper handled and the symptoms of sick building syndrome in some studies, particularly those in low-technology government departments.27 No carbon required paper has also been associated with respiratory and dermal symptoms,52 as well as the usual sick building syndrome symptoms,30 perhaps due to release of the inks encapsulated on the back of the top sheets, a particular problem during paper shredding. Paper is a major contributor to the fibrous dust associated with symptoms in some studies. After adjustment for the factors described above, the average number of work related symptoms per building occupant (the building symptom index), still shows a four- to fivefold difference between good and bad buildings (fig 1).1 The building symptom index is stable over time, provided that proper sampling is used to avoid responder bias, and a sample size of about 100 is used.39 In general naturally ventilated buildings have fewer symptomatic occupants than those from air conditioned offices,1,45–49 despite measurements of air quality being better in the air conditioned buildings. It seems that the major factors controlled by air conditioning can have both positive and negative effects; the balance often being decided by post-design factors, particularly plant and system maintenance.39 The main factors which have been studied include fresh air ventilation rates, temperature, humidity, dust, and the microbial content of the air. Finding an association between these factors and symptoms does not however imply that altering that factor is likely to reduce symptoms. It is quite likely that all of them are surrogate makers of the underlying causes. Similar problems have been found in hospitals,19,20,54 where the confounding factors of allergens such as latex, infected patients, and a more mobile workforce present problems with epidemiological studies of sick building syndrome. Increasing symptoms with temperatures above 23°C has been one of the more consistent findings in northern European studies.27,39,40 There is however an association between increasing temperature, overcrowding, and inadequate ventilation which makes it difficult to pinpoint the causative factor. The humidity of indoor air is very dependent on the outdoor climate. Humidification of air to reach indoor air quality standards has not been shown to reduce SBS symptoms. There is an association between the presence of a humidifier in the air conditioning circuit and symptoms, rather than the reverse.1 As with many other factors, humidity can be good and bad. In parts of Scandinavia the humidity may be below 10% for the winter months; there is some evidence that increasing this to around 25% is associated with decreasing symptoms.58 In more temperate climates the humidity indoors rarely falls below 25%; humidifiers in these circumstances can do more harm than good. Humidifiers in the ventilation circuit provide a place for microbes to flourish, and also provide a reason for adding biocides to humidified water. Many of these biocides are irritants or allergens in their own right, for example, isothiozolinones,59–61 glutaraldehyde,62,63 chloramine,64 chlorhexidine,65 benzalkonium chloride,66 and chlorine or nitrogen trichloride.67–69 Their addition to the water used for humidification will result in exposure to the building occupants.60 There are so far no intervention studies investigating biocides in air conditioning systems. They provide a plausible cause for the increased symptoms seen in systems containing a humidifier. In other areas dehumidifiers and chillers can be a potential problem. Water removed from the air can become stagnant and act as a reservoir for microbial growth in the air conditioning system. Many chillers are situated in ceiling and wall spaces where maintenance is difficult. Microbial contamination of chiller condensate trays has caused asthma in one English office. There are no generally agreed methods of assessing the freshness of indoor air. Fanger has developed units of smell emission (the Olf, defined as the smell emission derived from a standard non-smoking person having 0.7 baths per day) and perceived effect (the decipol, the smell in a 10 m3 room containing the standard man, ventilated with fresh air at 10 l/s). Decipols are measured using a panel of trained sniffers.70,71 They can be used to find the source of smells, such as sampling air before and after filters in the air supply ducting. He has shown that the building itself, its ventilation system, the contents such as carpets and furnishings, and its inhabitants, are all measurable sources. For instance the average smoker emits 6 olfs, against 1 for a non-smoker. There is an assumption that all smells are bad. This approach is leading to the quantification and hopefully the elimination of sources. By medical standards the symptoms of sick building syndrome are relatively trivial. Symptoms are generally more common and more problematical in the stressed, the unloved, and in individuals who feel powerless to change their situation. There is a strong association between lack of control of the office environment and symptoms.1,44 There is an association between environmental and job stress and symptoms.24 An inadequate system for dealing with environmental complaints had the strongest correlation with symptoms in one Dutch study.28,74 Good communication between workers, occupational health staff, and building service managers and their plant staff is fundamental to improving existing sick buildings. General guidelines for the management of building services are shown in box 4. The economic consequences of the sick building syndrome relate to the decreased or increased productivity resulting from the working environment, the costs of labour, and the costs of providing the environment. These factors vary widely in different countries and environments. Raw (evidence submitted to the UK parliamentary select committee on the environment) assessed the costs of sick building syndrome in a large government office with 2500 occupants, assuming one day’s sickness absence per year attributed to sick building syndrome and one hour per month dealing with or complaining about the indoor environment. At 1990 prices the costs to the organisation were £400 000 for one year. Unfortunately it is very difficult to measure productivity in thinking office workers, but chamber experiments have shown faster text typing when the outside ventilation rate was increased from 3, through 10 to 30 litres/sec/person.57 Sickness absence has been used as a surrogate for productivity in several epidemiological surveys; sickness absence however has many determinants apart from the health of the worker. The British office environment study1 included a question asking the worker how much they thought the office environment affected their productivity (on a nine point scale from −40% to +40%). Interestingly there were some workers who thought that the office environment increased their productivity. There was a clear linear relation between the number of work related symptoms of sick building syndrome and self assessed productivity, suggesting that the “disease” was the cause of the reduced productivity.76 The study also showed a clear relation between the type of building and the building symptom index. Those with an average of two (out of 10) work related symptoms had a neutral effect on productivity. The majority of buildings with a building symptom index under two were naturally ventilated with cellular offices and substantial worker control of their environment. A small study has shown improvement in both self rated productivity and measured sickness absence in an office building retrofitted with an air filtration system with both carbon and HEPA filters fitted to each workstation, taking air from the room.11 The intervention area was compared to a control floor of the building. There was a 61% reduction in certified sickness absence compared with a similar period the previous year, equivalent to a 3.1% increase in productive time per worker. A small control area was included on the intervention floor, where the furniture and fan unit was installed without the filtration system. Similar improvements in air quality assessment and symptoms were seen in this area, raising the possibility that the fan unit rather than the filtration were responsible for the improvement. The current evidence suggests that individuals vary significantly in their requirements for indoor air quality, so that it is not possible to provide one environment that suits a large proportion of the workforce. Workers who are unable to alter environments which they find unsatisfactory are more likely to develop sick building syndrome. Their inability to improve their environment is a source of stress which can contribute to their symptoms, and perhaps to their reduced productivity.38 The workers in a building are its most expensive commodity; looking after their environment as well as that needed for the mainframe computer is likely to be cost effective. Burge PS, Hedge A, Wilson S, et al. Sick building syndrome; a study of 4373 office workers. Ann Occup Hyg1987;31:493–504. ▸First major study looking at a wide range of buildings including those with natural ventilation. Franck C. Eye symptoms and signs in buildings with indoor climate problems (“office eye syndrome”). Acta Opthalmologica (Copenhagen)1986;64:306–11. Franck C, Skov P. Foam at inner eye canthus in office workers, compared with an average Danish population as control group. Acta Opthalmologica (Copenhagen)1989;67:61–8. Franck C, Skov P. Evaluation of two different questionnaires used for diagnosing ocular manifestations in the sick building syndrome on the basis of an objective test. Indoor Air1991;1:5–11. Brasche S, Bullinger M, Bronisch M, et al. Eye and skin symptoms in German office workers-subjective perception vs. objective medical screening. Int J Hygiene Environ Health2001;203:311–16. Muzi G, dell’Omo M, Abbritti G, et al. Objective assessments of ocular and respiratory alterations in employees in a sick building. Am J Ind Med1998;34:79–88. Rycroft RJG. Low humidity and microtrauma. Am J Ind Med1985;8:371–3. Sundell J, Lindvall T, Stenberg B, et al. Sick building syndrome in office workers and facial skin symptoms amongst VDT-workers in relation to building and room characteristics. Two case-referent studies. Indoor Air1994;4:83–94. Carmichael AJ, Roberts DL. Visual display units and facial rashes. Contact Dermatitis1992;26(1):63–4. Anderson I, Lundquist GR, Proctor DF. Human perception of humidity under four controlled conditions. Arch Environ Health1973;26:22–7. Hedge A, Mitchell GE, McCarthy JF, et al. Effects of a furniture-integrated breathing-zone filtration system on indoor air quality, sick building syndrome, productivity and absenteeism. In: Seppanen O, Railio J, Sateri J, eds. Indoor Air 93, 5th edn. Helsinki, 1993:383–8. Burge PS, Robertson AS, Hedge A. Validation of self-administered questionnaire in the diagnosis of sick building syndrome. Proceedings of the Fifth International Conference in Indoor Air Quality and Climate, Ottowa1990;1:575–80. Burge PS, Robertson AS, Hedge A. The development of a questionnaire suitable for the surveillance of office buildings to assess the building symptom index, a measure of the sick building syndrome. In: Jaakkola JJK, Ilmarinen R, Seppanen O, eds. Indoor Air 93. Helsinki, 1993:731–6. Raw GJ, Whitehead C, Robertson AS, et al.A questionnaire for studies of sick building syndrome. TCR 6/95. Garton, Watford: Building Research Establishment, 1995. ▸An approved questionnaire for studying sick building syndrome. Berglund B, Gidlof Gunnarsson A, Soames J. Reliability and validity of a sick building syndrome questionnaire. Archives of the Centre for Sensory Research2002;7:83–125. Stenberg B, Mild KH, Sandstrom M, et al. The office illness project in northern Sweden. Part 1: a prevalence study of sick building syndrome related to demographic data, work characteristics and building factors. Indoor Air 901990;4:627–32. Stenberg B, Eriksson N, Hoog J, et al. The sick building syndrome (SBS) in office workers. A case-referent study of personal, psychosocial and building-related risk indicators. Int J Epidemiol1994;23:1190–7. Mizoue T, Reijula K, Andersson K. Environmental tobacco smoke exposure and overtime work as risk factors for sick building syndrome in Japan. Am J Epidemiol2001;154:803–8. Nordstrom K, Norback D, Akselsson R. Subjective indoor air quality in hospitals—the influence of building age, ventilation flow, and personal factors. Indoor Environ1995;4:37–44. Nordstrom K, Norback D, Akselsson R. Influence of indoor air quality and personal factors on the sick building syndrome (SBS) in Swedish geriatric hospitals. Occup Environ Med1995;52:170–6. Brasche S, Bullinger M, Morfeld M, et al. Why do women suffer from sick building syndrome more than men? Subjective higher sensitivity versus objective causes. Indoor Air2001;11:217–22. Ooi PL, Goh KT, Phoon MH, et al. Epidemiology of sick building syndrome and its associated risk factors in Singapore. Occup Environ Med1998;55:188–93. Mikatavage MA, Rose VE, Funkhouser E, et al. Beyond air quality—factors that affect prevalence estimates of sick building syndrome. American Industrial Hygiene Association Journal1995;56:1141–6. Hedge A, Burge PS, Robertson AS, et al. Work related illness in offices: a proposed model of the sick building syndrome. Environ Int1989;15:143–58. Skov P, Valbjorn O, Pedersen BV. Influence of personal characteristics, job-related factors and psychological factors on the sick building syndrome. Scand J Work Environ Health1989;15:286–95. Stenberg B, Wall S. Why do females report sick building symptoms more often than males? In: Jaakkola JJK, Ilmarinen R, Seppanen O, eds. Indoor Air 93. Helsinki, 1993:399–404. Skov P, Valbjorn O. The sick building syndrome in the office environment; the Danish town hall study. Environ Int1987;13:339–49. ▸A seminal paper on sick building syndrome in naturally ventilated buildings, introducing office dust as a cause of symptoms. Zweers T, Preller L, Brunekreef B, et al. Health and indoor climate complaints of 7043 office workers in 61 buildings in the Netherlands. Indoor Air1992;2:127–36. ▸The largest multi-building study using the same protocol implicating complaint handling in aetiology. Sundell J, Lindvall T, Stenberg B. Associations between type of ventilation and air-flow rates in office buildings and the risk of SBS-symptoms among occupants. Environ Int1994;20:239–51. Jaakkola MS, Jaakkola JJ. Office equipment and supplies: a modern occupational health concern? Am J Epidemiol1999;150:1223–8. Raynal A, Burge PS, Robertson AS, et al. Estimated reduction in exposure to environmental tobacco smoke through removing smoking in the workplace. In: Jaakkola JJK, Ilmarinen R, Seppanen O, eds. Indoor air 93, Helsinki, 1993:639–43. Raynal A, Burge PS, Robertson AS, et al. How much does environmental tobacco smoke contribute to the building symptom index? Indoor Air1995;5:22–8. Hedge A, Sterling TD, Sterling EM, et al. Indoor air quality and health in two office buildings with different ventilation systems. Environ Int1989;15:115–28. Robertson AS, Burge PS, Hedge A, et al. The relationship between passive cigarette smoke exposure in office workers and the symptoms of building sickness. In: Perry R, Kirk P, eds. Indoor and ambient air quality1991;1988:320–6. Gyntelberg F, Suadicani P, Nielsen JW, et al. Dust and the sick building syndrome. Indoor Air1994;4:223–38. Niven RM, Fletcher AM, Pickering CAC, et al. Building sickness syndrome in healthy and unhealthy buildings: an epidemiological and environmental assessment with cluster analysis. Occup Environ Med2000;57:627–34. Mendell MJ, Fisk WJ, Petersen MR, et al. Indoor particles and symptoms among office workers: results from a double-blind crossover study. 2002;13:296–304. Hedge A, Erickson WA, Rubin G. Psychological correlates of sick building syndrome. In: Jaakkola JJK, Ilmarinen R, Seppanen O, eds. Indoor Air 93. Helsinki, 1993:345–50. Burge PS, Jones P, Robertson AS. Sick building syndrome; environmental comparisons of sick and healthy buildings. Indoor Air 901990;1:479–83. ▸A seminal paper implicating ventilation plant maintenance and manuals in sick building syndrome. 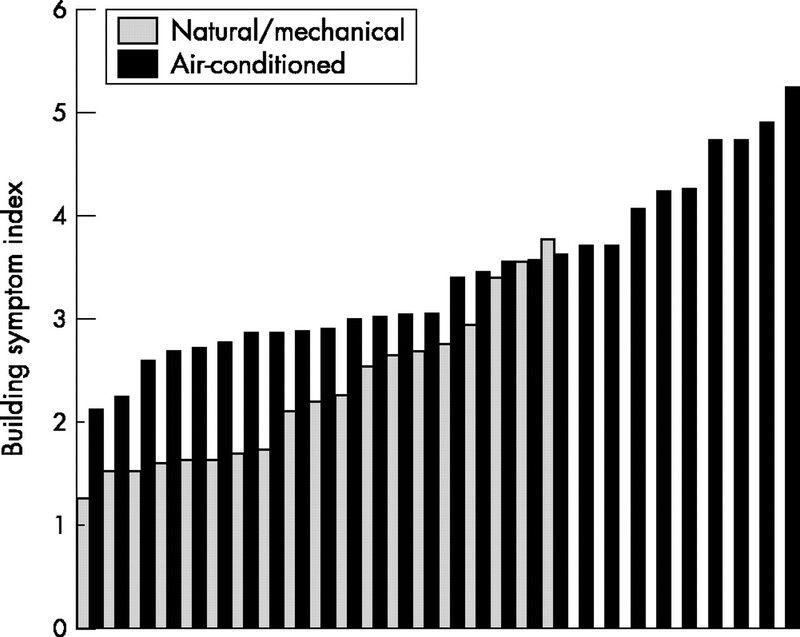 Jaakkola JJK, Heinonen OP, Seppanen O. Sick building syndrome, sensation of dryness and thermal comfort in relation to room temperature in an office building: need for individual control of temperature. Environ Int1989;15:163–8. Seppanen OA, Fisk WJ, Mendell MJ. Association of ventilation rates and CO2 concentrations with health and other responses in commercial and industrial buildings. Indoor Air1999;9:226–52. Mendell MJ, Smith AH. Consistent pattern of elevated symptoms in air-conditioned office buildings: a reanalysis of epidemiologic studies. Am J Public Health1990;80:1193–9. Hedge A, Mitchell GE, McCarthy JF, et al. Effects of a furniture-integrated breathing-zone filtration system on indoor air quality, sick building syndrome, and productivity. Indoor Air1993;3:328–36. Menzies D, Pasztor J, Nunes F, et al. Effects of new ventilation system on health and well-being of office workers. Arch Environ Health1997;52:360–7. Costa MF, Brickus LS. Effects of ventilation systems on prevalence of symptoms associated with sick buildings in Brazilian commercial establishments. Arch Environ Health2000;55:279–83. Tecelescu DB, Sauleau EA, Massin N, et al. Sick building symptoms in office workers in north-eastern France: a pilot study. Int Arch Occup Environ Health1998;71:353–6. Finnegan MJ, Pickering CAC, Burge PS. The sick building syndrome: prevalence studies. BMJ1984;289:1573–5. ▸The first study of sick building syndrome. Robertson AS, Burge PS, Hedge A, et al. Comparison of health problems related to work and environmental measurements in two office buildings with different ventilation systems. BMJ1985;291:373–6. Harrison J, Pickering CAC, Finnegan MJ, et al. The sick building syndrome, further prevalence studies and investigation of possible causes. Indoor Air 871987;2:487–91. Li CS, Hsu CW, Lu CH. Dampness and respiratory symptoms among workers in daycare centers in a subtropical climate. Arch Environ Health1997;52:68–71. Wessen B, Schoeps KO. Microbial volatile organic compounds—what substances can be found in sick buildings? Analyst1996;121:1203–5. Norback D, Wieslander G, Gothe CJ. A search for discomfort-inducing factors in carbonless copying paper. Am Ind Hyg Assoc J1988;49:117–20. Hedge A, Erickson WA, Rubin G. Effects of restrictive smoking policies on indoor air quality and sick building syndrome: a study of 27 air-conditioned offices. In: Jaakkola JJK, Ilmarinen R, Seppanen O, eds. Indoor Air 93. Helsinki, 1993:517–22. Fletcher AM, Niven RM, Pickering CAC. Prevalence of building sickness syndrome in hospital outpatient departments. Thorax1990;46:313. Menzies RI, Tamblyn RM, Tamblyn RT, et al. Sick building syndrome: the effect of changes in ventilation rates on symptom prevalence: the evaluation of a double blind experimental approach. Indoor Air 901990;1:519–24. Jaakkola JJK, Miettinen P. Ventilation rate in office buildings and sick building syndrome. Br J Ind Med1995;52:709–14. ▸A good study investigating the effects of ventilation changes in SBS. Wargocki P, Wyon DP, Sundell J, et al. The effects of outdoor air supply rate in an office on perceived air quality, sick building syndrome (SBS) symptoms and productivity. Indoor Air2000;10:222–6. Reinikainen LM, Jaakkola JJK, Helenius T, et al. The effect of air humidification on symptoms and environmental complaints in office workers. A six period cross-over study. Indoor Air 901990;1:775–80. ▸A good study investigating the effects of humidification on SBS symptoms. Nagorka R, Rosskamp E, Seidel K. Air conditioning-assessment of humidification units. Off Gesundh-Wes1990;52:168–73. Rosskamp E. Air-conditioning plants—a health problem. Bundesgesundhblad1990;3/90:117–21. Clark EG. Risk of isothiazolinones. J Soc Occup Med1987;37:30–1. Gannon PFG, Bright P, Campbell M, et al. Occupational asthma due to glutaraldehyde and formaldehyde in endoscopy and X-ray departments. Thorax1995;50:156–9. Curran AD, Burge PS, Wiley K. Clinical and immunological evaluation of workers exposed to glutaraldehyde. Allergy1996;51:826–32. Blasco A, Joral A, Fuente R, et al. Bronchial asthma due to sensitization to chloramine T. J Invest Allergol Clin Immunol1992;2:167–70. Waclawski ER, McAlpine LG, Thomson NC. Occupational asthma in nurses due to chlorhexidine and alcohol aerosols. BMJ1989;298:929–30. Burge PS, Richardson MN. Occupational asthma due to indirect exposure to lauryl dimethyl benzyl ammonium chloride used in a floor cleaner. Thorax1994;49:842–3. Pickering CAC, Mustchin CP. “Coughing water”, bronchial hyperreactivity induced by swimming in a chlorinated pool. Thorax1979;34:682–3. Deschamps D, Soler P, Rosenberg N, et al. Persistent asthma after inhalation of a mixture of sodium hypochlorite and hydrochloric acid. Chest1994;105:1895–6. Thickett KM, McCoach JS, Gerber JM, et al. Occupational asthma caused by chloramines in swimming-pool air. Eur Respir J2002;19:827–32. Fanger PO, Lauridsen J, Bluyssen P, et al. Air pollution sources in offices and assembly halls, quantified by the olf unit. Energy and Buildings1988;12:7–19. Fanger PO. Introduction of the olf and decipol units to quantify air pollution perceived by humans indoors and outdoors. Energy and Buildings1988;12:1–6. Pan Z, Molhave L, Kjaergaard SK. Effects on eyes and nose in humans after experimental exposure to airborne office dust. Indoor Air2000;10:237–45. Leinster P, Raw GJ, Thomson N, et al. A modular longitudinal approach to the investigation of sick building syndrome. Indoor Air 901990;1:287–92. Preller L, Zweers T, Boleij JSM, et al. Gezondheidsklachten en klachten over het binnenklimaat in kantoorgebouwen. Directoraat-Generaal van de Arbeid1990;S83:1–62. WHO. Indoor air quality: biological contaminants. WHO regional publications. European series no. 3. WHO, 1990:1–54. Raw GJ, Leaman A. Further findings from the office environment study: productivity. Proceedings of the 5th International Conference on Indoor Air Quality and Climate. International Conference on Indoor Air Quality and Climate, Ottowa, 1990;1:231–6. Guberan E, Dang VB, Sweetman PM. L’humidification de l’air des locaux previent-elle les maladies respiratoires pendant l’hiver. Schweiz Med Wochenschr1978;108:827–31. Robertson AS, Roberts KT, Burge PS, et al. The effect of change in building ventilation category on sickness absence rates and the prevalence of sick building syndrome. Indoor Air 901990;1:237–42. ▸A good study investigating sickness absence related to SBS symptoms and moving to and from air conditioned buildings.